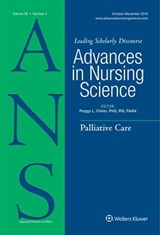 Susan Bonis’ featured article, which describes a philosophic (hermeneutic) study, is an example of scholarship that some assume is far removed from the practical realm of nursing practice. But to the contrary, this thought-provoking article sheds light on one of the most vexing challenges of human practice – how do people come to a sense of enduring serenity (contentment) in the midst of the disharmony created by serious health challenges? As Dr. Bonis states in her article: “Evidence-based practices begin with understanding the science that underpins the discipline. Nursing is a human science; therefore, it is essential to understand the basic human phenomena that underpin being human, such as contentment.” (see page 274 of her article, available for free download until 9/30/12). Dr. Bonis examined the published memoir of Dawn Prince-Hughes, a researcher of primate identity and culture. The memoir, titled “Songs of a Gorilla Nation: My Journey through Autism,” recounts Prince-Hughes’ experience of coming to understand her own journey living with autism. Dr. Bonis’ hermenuetic interpretation of the memoir, cast in the perspective of the nursing human becoming philosophic framework, provides the basis for her analysis of the experience of contentment. As a reader of this article, you may not share for yourself the human becoming philosophy, but you will find connections between this philosophy and the most fundamental of nursing concerns. For me one of the fundamental nursing concerns that this article addresses is that of promoting high-level wellness. Dr. Bonis describes the process of contentment as a paradoxical living calm-turbulence in challenging situations – a process that seems to me as central to the basic nursing concept of high-level wellness. In her conclusion, Dr. Bonis states that “As humans live rhythms of contentmentdisharmony, contentment is glimpsed in serene and pleasurable moments of feeling listened to, understood, cared for, loved, and respected, as well as in moments when they trust, unburden, and laugh while all-at-once acquiescing to arduous situations.” (See page 282). What an inspiring image for nursing practice, and for the outcomes that I believe we all seek! Let us know your thoughts and responses to this featured article! Leave your comments here – and we will respond! As a researcher who focuses on thriving I find the idea of contentment as affirming. I think much is to be learned from understanding the positive realm of health, so that we as nurses can be conduits to resources, and developers of interventions that enhance these positives. I also appreciate that here contentment is situated in a context full of challenges and risks, because that is the world we live in. Contentment in the context of contention?